Other people who really-really deserves a tip, are the Street Tango Dancers. As a private tour guide to Buenos Aires, I go to Caminito and San Telmo very often, and they are there, under the sun, the rain, the wind, the cold, the heat, dancing and smiling. They live on the tips and they deserve them, so to take a memorable shot of them and to not leave at least one, two dollars in their hat, is more than mean, is cruel! In restaurants, tip should be in cash the 99% of the ocasions, due to is not allowed by law to add any amount to the bill just writting an extra amount, even if you tell to the waiter in advance, it is very complicated to pay the tip by credit card. Dollars if are not too spoiled, are gratefully accepted! 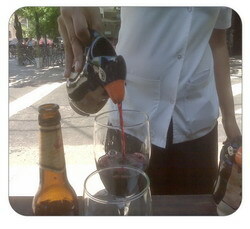 By the way, what my Waiter Friend of this for-local-people grill is doing is to serve the wine of the house in a "pengüin", Interesting, Right?